Pelvic and uterine arteriovenous malformations (AVMs) can cause abnormal and potentially life-threatening vaginal bleeding. Although they are considered relatively rare, with fewer than 150 cases reported in the literature, the true incidence of uterine AVMs may be higher. A prospective study of 959 patients found sonographically evident uterine AVMs in 5.2% of women after dilatation and curettage and in 0.22% of women after delivery; however, only one (0.1%) AVM in the study population was deemed clinically significant.1 Pelvic AVMs and uterine AVMs are distinct entities with different etiologies, presentation, and management. Both pelvic and uterine AVMs result from one or more sites of abnormal direct communication between an artery and a vein without an intervening capillary bed. The subsequent diversion of blood flow along the pressure gradient into the venous system results in increased pressure and high-velocity flow, as well as marked vascular enlargement, in the venous system. Pelvic AVMs are usually sporadic congenital abnormalities. As in AVMs occurring elsewhere in the body, the arteriovenous communications in pelvic AVMs can vary widely in size, number, and location. These developmental anomalies are thought to result from abnormal endothelial cell proliferation and delayed vascular remodeling during fetal angiogenesis.2 Acquired pelvic arteriovenous communications may also arise from trauma or surgery, although these are typically referred to as fistulas and are often simpler, with fewer arteriovenous communications than in congenital malformations. Although pelvic AVMs may extend to involve the uterus, they should be distinguished from uterine AVMs, in which the arteriovenous communications exist entirely within the uterus. The majority of uterine AVMs are thought to be acquired and could more accurately be termed fistulas rather than true malformations. These acquired uterine AVMs often demonstrate more complex and numerous arteriovenous communications than typical arteriovenous fistulas and are more analogous to congenital AVMs, which may be due to the rich vascularity and dense network of anastomoses within the uterus. Most symptomatic pelvic and uterine AVMs present with abnormal vaginal bleeding ranging from frequent spotting to catastrophic hemorrhage; menorrhagia, metrorrhagia, menometrorrhagia, and postcoital bleeding have all been described as presenting symptoms. Pelvic pain or pressure, including neuropathic pain such as sciatica, can also be a presenting symptom. Pelvic AVMs may present with other evidence of increased venous pressure such as vulvar varices or, in severe cases, lower extremity venous congestion. Hematuria, urinary difficulties, and hemospermia have been reported as presenting symptoms in male patients with pelvic AVMs.4 High-flow left-to-right shunts are also a known cause of high-output cardiac failure. An increasing number of asymptomatic uterine and pelvic AVMs are diagnosed incidentally as the use of imaging grows. Figure 1. 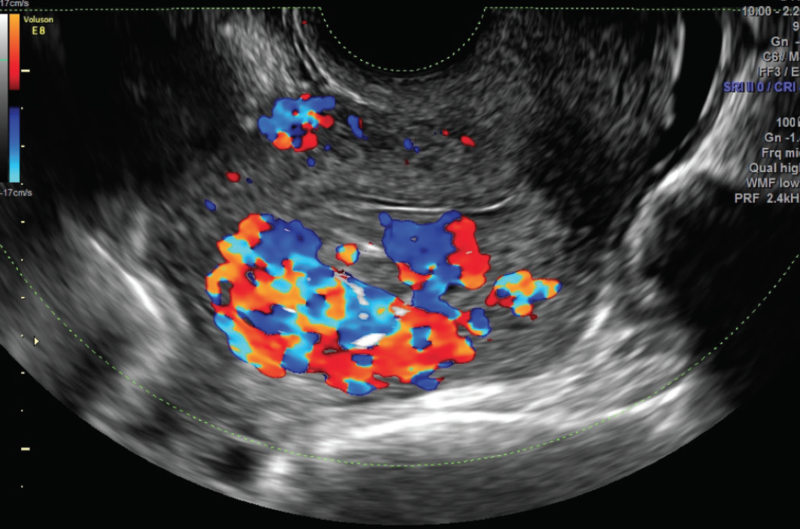 Sagittal color Doppler ultrasound of the uterus demonstrating markedly increased flow with aliasing, primarily within the myometrium. Figure 2. Coronal maximum-intensity projection image from contrast-enhanced dynamic MRA demonstrating early filling of numerous enlarged veins in the uterus and pelvis with primary drainage via an enlarged left ovarian vein to the left renal vein. Either CT or MRI can be used to better delineate the anatomy of a pelvic or uterine AVM, help identify involved organs and structures, and aid in preprocedural planning. Typical findings include uterine enlargement with or without a focal mass, disruption of the uterine junctional zones on MRI, and numerous enlarged myometrial and parametrial vessels. Early filling of these dilated venous structures via brisk arterial shunting is the characteristic feature of AVMs. Although these abnormal flow dynamics can be identified on CTA with optimal bolus and scan timing, they can be more consistently captured on dynamic contrast-enhanced MRA (Figure 2). Other advantages of MRI include better characterization of the pelvic organs and the lack of ionizing radiation; the latter may be of particular interest in reproductive-age women. For these reasons, dynamic contrast-enhanced MRA may be the preferred imaging modality for cross-sectional imaging of pelvic and uterine AVMs. The better spatial resolution of CT can aid in localizing and characterizing the arteriovenous communications if not adequately characterized by MRI. Digital subtraction angiography (DSA) remains the gold standard for diagnosis of uterine and pelvic AVMs. Diagnostic DSA is essential to treatment planning and provides an unmatched level of detail in identifying and localizing arteriovenous communications. The defining feature of AVMs on DSA is brisk early filling of numerous enlarged veins emerging from a nidus, or nest, of abnormal vessels after arterial contrast injection (Figure 3 and Figure 4). Due to advances in noninvasive imaging, many interventionalists use these imaging studies for the majority of preprocedural planning and perform initial diagnostic DSA to confirm and refine the treatment plan within the same procedure as the planned endovascular therapy. Nonetheless, noninvasive imaging does not always provide adequate information for planning of these complex treatments; in these cases, diagnostic DSA can be performed prior to the day of treatment. Figure 3. Pelvic arteriogram demonstrating an enlarged right uterine artery with right-sided uterine nidus, suggesting early venous filling. Arterial enlargement is attributable to increased flow through this vessel to the low-pressure sump of the arteriovenous communication (A). Slightly delayed image from same pelvic arteriogram confirming early venous drainage from the right aspect of the uterus via right internal iliac and right ovarian veins (B). Figure 4. 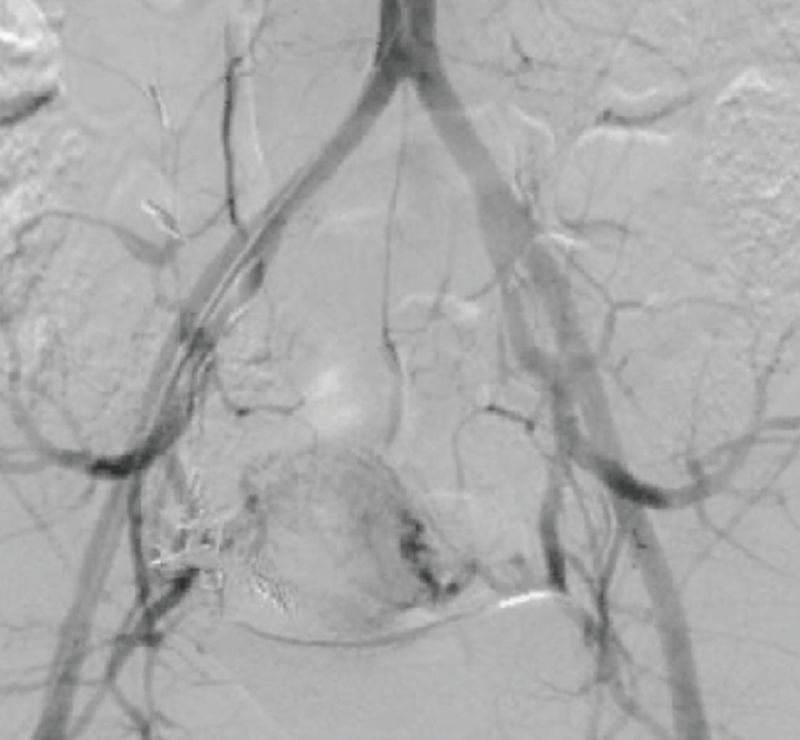 Angiogram after right internal iliac artery injection demonstrates simultaneous contrast opacification of distal intrauterine arterial branches and dilated draining veins, indicating brisk arteriovenous shunting. Figure 5. Postembolization pelvic arteriogram demonstrates no residual arteriovenous shunting or right uterine hypervascularity with n-butyl-cyanoacrylate glue casting right uterine artery branches and persistent flow to the uterus via other right uterine artery branches and the left uterine artery. Given these high clinical success rates, endovascular therapy is often the recommended initial therapy for uterine and pelvic AVMs requiring treatment. Various embolic agents have been successfully used, including PVA and other particulate embolic agents, liquid embolic agents including n-butyl-cyanoacrylate glue and Onyx (Medtronic), Gelfoam, and coils, and they are often used in combination. The successful use of ethanol, either alone or in combination with embolic agents, has also been described; however, this is more precisely termed a sclerosant than an embolic agent. 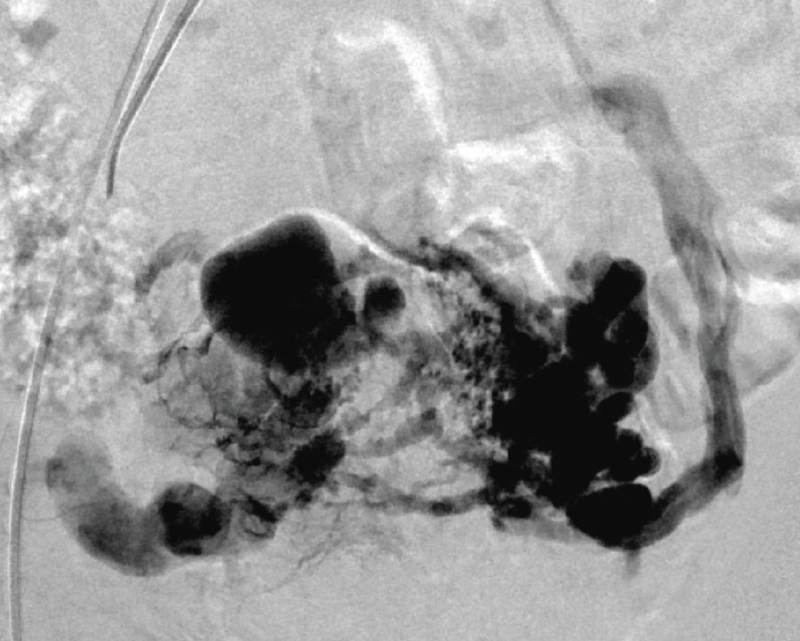 The goal of embolization is typically to eradicate the abnormal arteriovenous communications while maintaining perfusion to the uterus (Figure 5). As noted previously, successful pregnancies have been reported in many patients after endovascular treatment of uterine and pelvic AVMs. Treatment technique. Initial endovascular treatment of uterine AVMs is most commonly performed via a transarterial approach, typically by embolizing the branches of one or both uterine arteries. Transarterial embolization alone may be sufficient for definitive treatment of the AVM and can be undertaken more than once to target additional arterial branches if necessary. However, the arteriovenous communications cannot be adequately sealed via a transarterial approach in some cases. 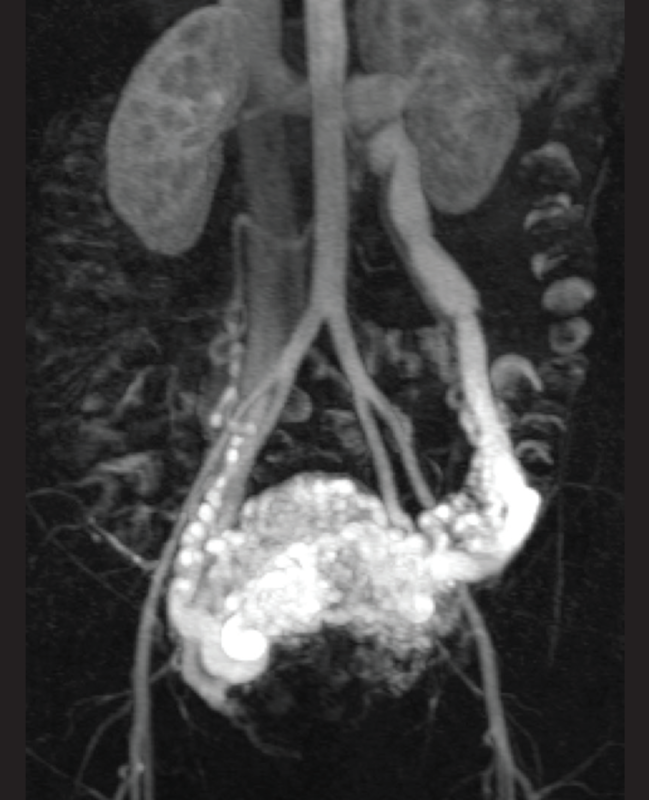 Although the immediate postembolization angiogram may appear to demonstrate successful treatment of the AVM, it will persist or appear to recur if one or more arteriovenous communications remain patent. The persistent pressure gradient will result in diversion of arterial flow to the low-pressure venous sump through even the tiniest collateral vessel. In this situation, a different approach or access may be required. Transvenous embolization or sclerotherapy may be performed via a femoral or jugular access. The retrograde transvenous approach can pose challenges in the treatment of a persistently high-flow AVM. Risks include nontarget delivery of embolic material to the pulmonary arteries and embedding the delivery catheter in liquid embolic agents. The nidus or proximal venous outflow of the AVM can also be directly punctured under ultrasound guidance, either percutaneously or transvaginally, with subsequent embolization or sclerotherapy. Thus, this approach requires cautious incremental treatment, particularly during sclerotherapy, to avert tissue damage due to reflux into the capillary bed. Arterial access for angiography is recommended even in transvenous and direct puncture procedures to facilitate assessment of anatomy, monitor treatment progress, and determine the treatment endpoint. Initial transarterial embolization, most commonly achieved in a preceding treatment rather than concurrently, confers the advantage of slowing flow through and decreasing the size of the residual arteriovenous communications. This reduces the risk of complications related to high flow (eg, nontarget pulmonary embolization, embedding the catheter in liquid embolic agent) but increases the risk of tissue damage due to retrograde flow of the treatment agent. 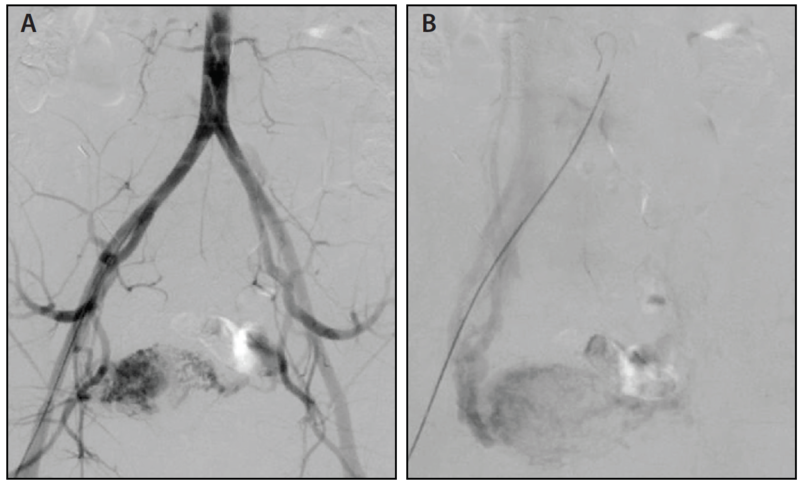 As a result, transarterial embolization remains the mainstay of first-line endovascular treatment of uterine AVMs, whereas the transvenous and direct puncture approaches serve as adjunctive measures for refractory arteriovenous communications. Surgical therapy for congenital pelvic AVMs is often more complicated due to the typically complex network of arteriovenous communications and intimate association of the abnormal vessels to critical structures within the pelvis. For these reasons, surgery is not performed as frequently for pelvic AVMs as for uterine AVMs. Uterine and pelvic AVMs are a rare cause of excessive and potentially catastrophic vaginal bleeding; however, asymptomatic or mildly symptomatic uterine AVMs may be more common than previously thought as detection increases with the use of routine imaging. Uterine AVMs are more typically acquired, whereas pelvic AVMs are classically congenital, with posttraumatic pelvic arteriovenous communications more commonly termed fistulas. Although DSA is the gold standard for diagnosis, ultrasound with color and spectral Doppler, CTA, and MRA can aid in characterizing these lesions as well as in management planning. Endovascular management with transcatheter embolization is the mainstay of therapy for both uterine and pelvic AVMs. Uterine AVMs refractory to endovascular interventions can be treated definitively with hysterectomy, while surgical management for pelvic AVMs poses a greater challenge. Growing evidence suggests that conservative management may be appropriate for many patients with uterine AVMs, particularly those with asymptomatic and/or lower-flow lesions. Close clinical follow-up and imaging are still recommended, as the factors that predict spontaneous resolution of these AVMs need to be better elucidated. 1. Yazawa H, Soeda S, Hiraiwa T, et al. Prospective evaluation of the incidence of uterine vascular malformations developing after abortion or delivery. J Minim Invasive Gynecol. 2013;20:360-367. 2. Mahmoud M, Allinson KR, Zhai Z, et al. Pathogenesis of arteriovenous malformations in the absence of endoglin. 3. Follen MM, Fox HE, Levine RU. Cervical vascular malformation as a cause of antepartum and intrapartum bleeding in three diethylstilbestrol-exposed progeny. Am J Obstet Gynecol. 1985;153:890-891. 4. Manabe Y, Uegaki M, Asazuma A. Two cases of congenital pelvic arteriovenous malformation in male [in Japanese]. Hinyokika Kiyo. 2011;57:25-28. 5. Huang W, Muradali D, Thurston WA, et al. Uterine arteriovenous malformations: gray-scale and Doppler US features with MR imaging correlation. Radiology. 1998;206:115-123. 6. Timor-Tritsch IE, Haynes MC, Monteagudo A, et al. Ultrasound diagnosis and management of acquired uterine enhanced myometrial vascularity/arteriovenous malformations. Am J Obstet Gynecol. 2016;214:731.e1-731.e10. 7. Forssman L, lundberg J, Schersten T. Conservative treatment of uterine arteriovenous fistula. Acta Obstet Gynecol Scand. 1982;61:85-87. 8. Wang Z, Chen J, Shi H, et al. Efficacy and safety of embolization in iatrogenic traumatic uterine vascular malformations. Clin Radiol. 2012;67:541-545. 9. Ghai S, Rajan DK, Asch MR, et al. Efficacy of embolization in traumatic uterine vascular malformations. J Vasc Interv Radiol. 2003;14:1401-1408. 10. Yoon DJ, Jones M, Al Taani J, et al. A systematic review of acquired uterine arteriovenous malformations: pathophysiology, diagnosis, and transcatheter treatment. AJP Rep. 2016;6:e6-e14. 11. Kim SM, Park EK, Jeung IC, et al. Abdominal, multi-port and single-port total laparoscopic hysterectomy: eleven-year trends comparison of surgical outcomes complications of 936 cases. Arch Gynec Obstet. 2015;291:1313-1319. 12. Clarke-Pearson DL, Geller EJ. Complications of hysterectomy. Obstet Gynecol. 2013;121:654-673. 13. Nonaka T, Yahata T, Kashima K, Tanaka K. Resolution of uterine arteriovenous malformation and successful pregnancy after treatment with a gonadotropin-releasing hormone agonist. Obstet Gynecol. 2011;117:452-455. 14. Morikawa M, Yamada T, Yamada H, Minakami H. Effect of gonadotropin-releasing hormone agonist on a uterine arteriovenous malformation. Obstet Gynecol. 2006;108:751-753. 15. Yan X, Zhao C, Tian C, et al. Ultrasound-guided high-intensity focused ultrasound ablation for treating uterine arteriovenous malformation. BJOG. 2017;124(suppl 3):93-96. 16. Wiebe ER, Switzer P. Arteriovenous malformations of the uterus associated with medical abortion. Int J Obstet Gynecol. 2000;71:155-158. 17. Degani S, Leibovitz Z, Shapiro I, Ohel G. Expectant management of pregnancy-related high-velocity uterine arteriovenous shunt diagnosed after abortion. Int J Obstet Gynecol. 2009;106:46-49. 18. Lee TY, Kim SH, Lee HJ, et al. Ultrasonographic indications for conservative treatment in pregnancy-related uterine arteriovenous malformations. Acta Radiol. 2014;55:1145-1152.